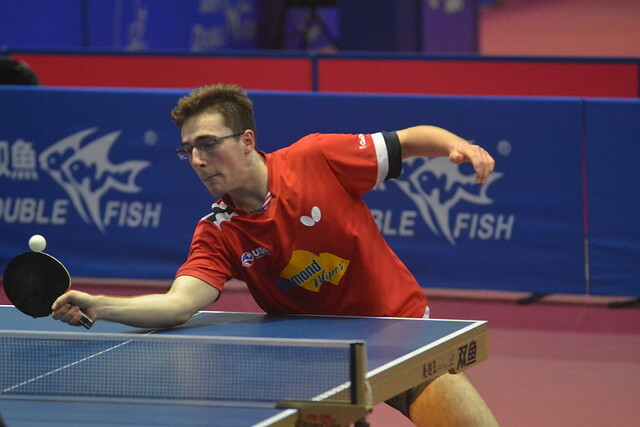 A familiar face on the ITTF World Junior Circuit, a semi-finalist earlier this year in Spain, Nicolas Burgos was the hero of the hour for Chile at the quarter-final stage of the Boys’ Team event on Wednesday 11th July at the 2018 Pan American Junior Championships in Santo Domingo, Dominican Republic. He remained unbeaten as the no.4 seeds recorded a full distance three-two win against Canada, the outfit listed one place lower but a team in form. Fielding Jeremy Hazin, Edward Ly and Terence Yeung, in the morning session of play, they had concluded their group stage fixtures by recording a three-one win against the no.7 seeds, the Dominican Republic outfit formed by Pedro Cabrera, Mariano Lockward and Noel Almonte. More pertinently, the previous day, the same Canadian trio had secured a shock three-one win in opposition to the no.3 seeds, Brazil’s Guilherme Teodoro, Eduardo Tomoike and Sergio Bignardi. The end result was first place in the group. Facing Chile the unbeaten run came to an end. Nicolas Burgos accounted for Terence Yeung (11-6, 11-4, 12-10) and Jeremy Hazin (11-3, 11-8, 9-11, 10-12, 11-3) to set the scene for Andres Martinez to complete the victory. He duly obliged, he overcame Terence Yeung (11-5, 12-10, 9-11, 15-13). The wins for Canada were secured by Jeremy Hazin against Andres Martinez (11-6, 11-3, 11-4) and by Edward Ly when facing Jorge Paredes (7-11, 12-10, 11-7, 11-8). A hard earned success for Chile, for Brazil who selected Guilherme Teodoro, Eduardo Tomoike and Enzo Nakashima, life was less exacting. They recorded a three-nil win in opposition to the no.6 seeds, Puerto Rico’s Francisco Mattias, Angel Naranjo and Gabriel Perez. In the semi-finals, Brazil meets the United States, Chile opposes Argentina. Top seeds, the United States, who selected from Kanak Jha, Sharon Alguetti, Nikhil Kumar and Nicholas Tito had secured first place in their group and a direct entry to the semi-finals on the opening day of action. Earlier on the second day of play, Argentina with Santiago Lorenzo, Leandro Fuentes and Alexis Orencel on duty; they had recorded a three-nil win against Trinidad and Tobago’s Derron Douglas, Luc O’Young and Javier King to seal first place in their group and like the United States a direct semi-final entry. The penultimate round fixtures are scheduled for later in the day.